Color photo of a little blond-haired girl with her hand on her heart in front of an American flag. I was in 5th grade when I realized I wasn't American. Not that I hadn't had some awareness of that fact from an early age... I mean, when you're a 10-year-old who can articulate the basic premises of communism, you start to understand that maybe you're not exactly original to the land of Twinkies and Wonder Bread. So yes, I'm Romanian and I've always known that, but it wasn't until one memorable day in 5th grade that I really started paying attention to just how un-American I was. The morning started off as normal. We said the Pledge of Allegiance, our teacher took attendance and we began our ritual "share" time -- the cool 5th grader's equivalent of show-and-tell. We heard the usual "I scored a goal in our soccer game", or "my mom bought me a hamster." And then it was my turn. "I passed my U.S. citizenship interview! ", I declared proudly... to a room full of blank stares. My teacher offered a tepid congratulations and moved on to the next student. And it was then that I started to fully internalize how un-American I was. While other kids were celebrating their "Leave It To Beaver" milestones, I was boasting about not having to leave the country. The citizenship incident was somewhat of an awakening to me... in my mind, I was no longer just the girl from Romania, but I was the un-American girl. And with that realization, I started to become acutely aware of all the other things that made me so different from my very American peers. Obviously, every culture has its own cuisine, so it's no surprise that the food I ate was different. 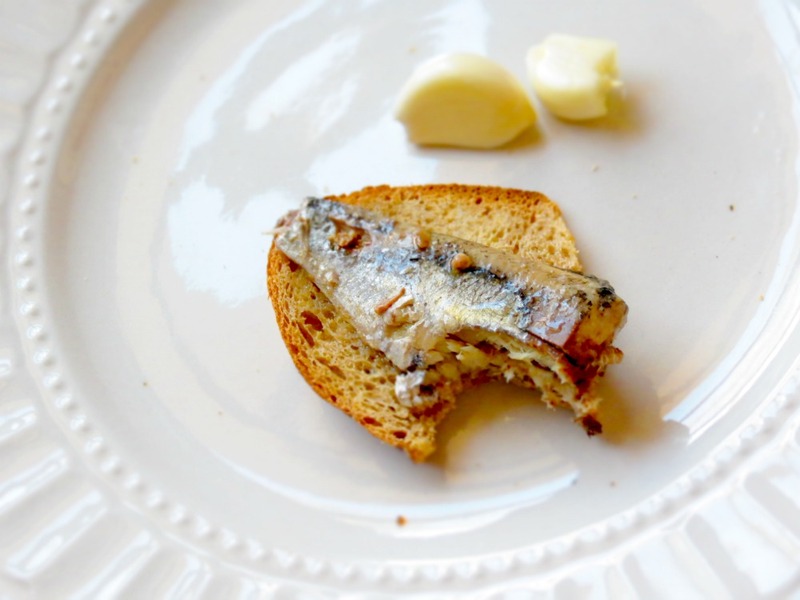 Sardines on toast with a side of raw garlic was totally normal dinner fare. As were pigs brains (yes, really) and stomach soup (named not for where it goes, but for what it's made out of). Still, it wasn't just the type of food I ate, but the beliefs surrounding it. Growing up, we owned only one measuring cup, which my mother used not for cooking, but to pour water into her iron. Imagine my surprise when, while baking brownies at a friend's house, my friend pulled out several measuring utensils... and we actually used them in the kitchen! In traditional Romanian culture, food is cooked with instinct ("ca la bunici"), not with frivolous things like measuring devices and recipes. I recently asked my dad how much oil to put in a Romanian cabbage salad. His response? "Until you FEEL it!" Another revelatory moment was the first time I went out eat with a friend, and watched in surprise as she ordered a drink with ice. What do you mean you get to drink something really cold? Aren't your parents worried you'll catch a sore throat? To this day, if I call my mom with a raspy voice, her first question (or perhaps accusation) is "You drank something cold, didn't you?" And Romanians have great angst over the power of the cold. I still remember going to a sleepover at an American friend's house. As we were getting changed into our pajamas, a girl asked me why I was wearing an undershirt (tucked into my underwear, nonetheless). Well, to keep my back covered so it doesn't catch a cold. Obviously. Did you know individual body parts could catch colds? Well, Romanian body parts can. Backs are particularly at risk, so we go to great lengths to keep them covered. I'm almost 30 years old and my dad will still reprimand me if my shirt lifts up in the back while bending over. Other susceptible body parts include stomachs, kidneys and ears (you'll rarely see a Romanian baby without a hat). Oh, and if you're a girl, take care to never sit on a cold surface unless you want your ovaries to catch a cold. Your ovaries. Romanian culture is full of medically sound beliefs like that. When any of my American friends got sick, their mothers gave them cold medicine. Me? I went to bed with a bag of hot salt on my chest. Sunburns? Forget Aloe Vera. My mother slathered on some yogurt and called it cured. Oh, and cuts? Those were the worst. Sure, antibiotic cream could have sped up the healing process, but that was for "the Americans." My mom preferred the "raw-onion-on-a-cut" approach... as if the pain from the wound itself wasn't enough. The thing is, it's not that we're anti-medicine. Heck, I got all of my vaccines three different times (one for each country we lived in) and my parents never batted an eye. It's just that, this is how "The Grandparents" did it, and they always knew best. Even now, as an adult married to a very American husband (straight out of "Leave it To Beaver") and living in a different state from my parents, my Romanian culture still permeates my mostly Americanized life. When most American parents hear their daughter is pregnant, they start making plans to visit after the baby is born. My mom, on the other hand, asked when she could move in. It's entirely common for Romanian grandparents to act as live-in caretakers while mom goes back to work. Personally, however, I think my parents just wanted a turn at being "The Grandparents" so they could pass on that infamous Romanian wisdom to my children. My mom did not, in fact, end up moving in (though sometimes I wish she could) and I probably won't be putting any onions in my First Aid kit, but as an adult, I can look back and appreciate my un-American upbringing. I learned to cook without recipes, I have a solid respect for homeopathy and let's be honest, I was basically never cold. Oh, and my dinner last night? Sardines on toast with a few cloves of raw garlic. Needless to say, though, neither my American husband nor my hybrid son shared my enthusiasm... or my un-American meal. A version of this piece first appeared on Best of Baby. You can join the Best of Baby community on Facebook and Twitter and follow along on Bloglovin'.